Unfortunately, I took only this one photo and, of course, have not seen the slugs since. Brunckhorst does not list Hawaii as a locality for this species, so Scott's original photo appears to be a record. Pauline also found a slide from Maui which she had misidentified as Phyllidiella pustulosa However, as far as I know no specimens have been collected, so final confirmation may be necessary. 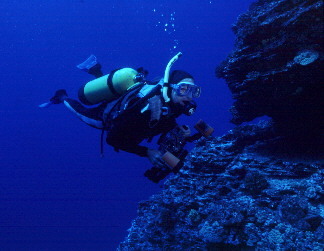 Brunckhorst records the species from the central Great Barrier Reef, Fiji and Lord Howe Island. Scott has also seen what he believes to be this species in the Marshall Islands. 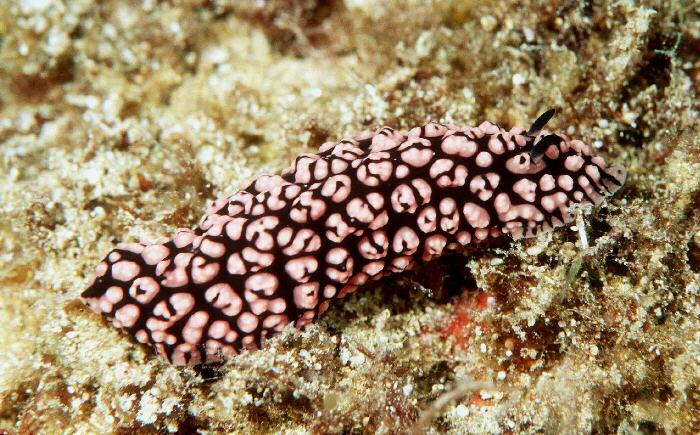 The Sea Slug Forum also records it from the Philippines and Vanuatu. John Hoover live in Honolulu, Hawaii. John has published two books on marine life of the Hawaiian Islands. His third, a field guide to the marine invertebrates of the Hawaii,is available now. With over 600 photographs, it covers over 500 species, including 66 of Hawaii's most colorful and interesting opisthobranchs. Updates and errata for John's invertebrate book are now available. Email John for a copy. © The Slug Site, Michael D. Miller 2001. All Rights Reserved.